Hello! Today I'm back with another 26 Great Nail Art Ideas post. 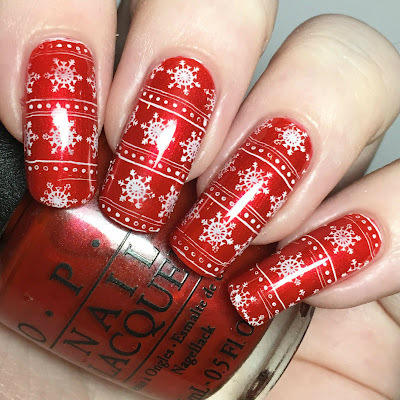 Today's prompt is 'Winter Warmth' and I immediately knew what I wanted to do - a Christmas jumper mani! I love snuggling up warm, and I'm one of those people that can't resist a Christmas jumper, or slippers, or anything! Here is what I came up with. Read onto find out more! 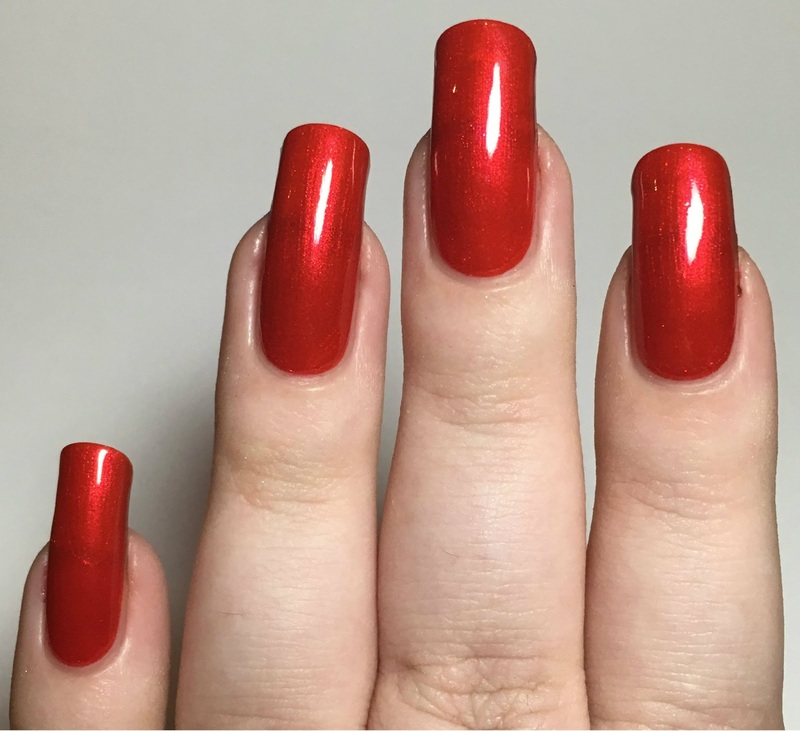 I started with a base of OPI 'Give Me A Lido Kiss', a bright red with red shimmer. I'm not a massive red person but this is beautiful, and it screams Christmas! This applies so easily although is a little bit sheer. I could just about see my nail line after a second coat but it covered so evenly and smoothly that I happily left it. Below is two coats and topcoat. For my stamping, I used the snowflake pattern on MoYou London Festive plate 03. The Christmas tree pattern would have worked too, but I actually used that for the last prompt ('black base' - post here). I stamped using Hit The Bottle 'Snowed In' and my Born Pretty clear stamper. I finished with a coat of quick dry topcoat. What do you think? I love these! They've got me far too excited for Christmas. They do remind me of wrapping paper as well as Christmas jumpers, but I'm more than happy with either! I know I said I'd try and hold off of the Christmas mani's, so I promise this is my last one until December now - even though that's not long at all! 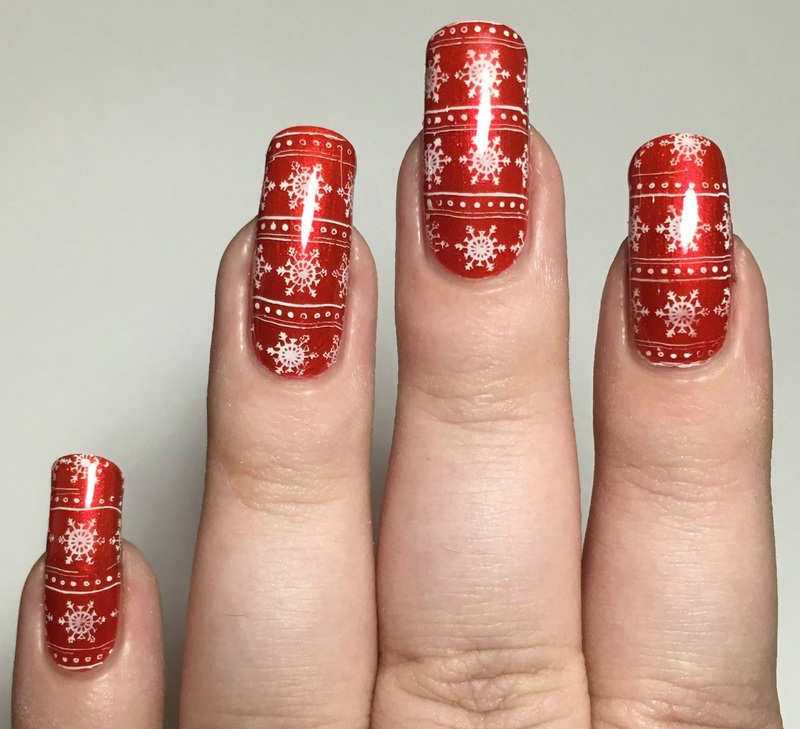 I love Christmas sweater nail art! Ooh this is amazing & I totally thought of wrapping paper when I saw them. 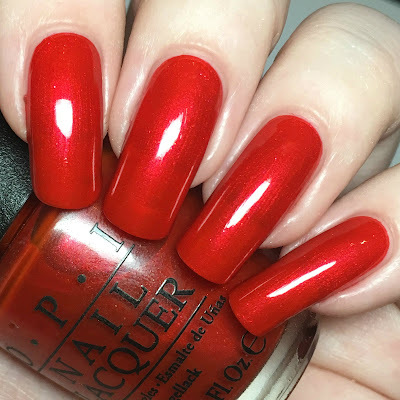 That OPI is stunning, the perfect Christmas red! so perfect! i love that OPI! Super cute! I love the look of that red. that red is on fire! The base colour is amazing! I actually don't own a "Christmas" sweater! I should change that lol. I always enjoy these Christmas mani, but the strange part is here in SA we have Summer so to wear a Christmas sweater would not be ayoba! But the red polish would always be lovely to paint your nails.